Solve this problem in a different way. I love this one! Kids that have always been good at math are very good at following the algorithms. But not thinking outside of the given method. They often do not like this question at the beginning of the year, but as they get more comfortable, I can see them excel in thinking. Kids that have struggled in math with the past will find this question a relief. "You mean I can do it my way?" These are the kids that have their system for solving problems but have been told they were wrong because it did not follow the teacher's way. Write a story for this question. So many students will mess up a simple integer subtraction problem like -12 - (-6), but if is say "You owe me $12, and your dad offers to take away $6 in debt, How much do you owe me?" They get it right every time. I want these kids to begin thinking of these situations on their own. Connecting the numbers to the real world is something most students will not do without help. Prove to me that your answer is correct. The strategy will be different for every concept and age group. 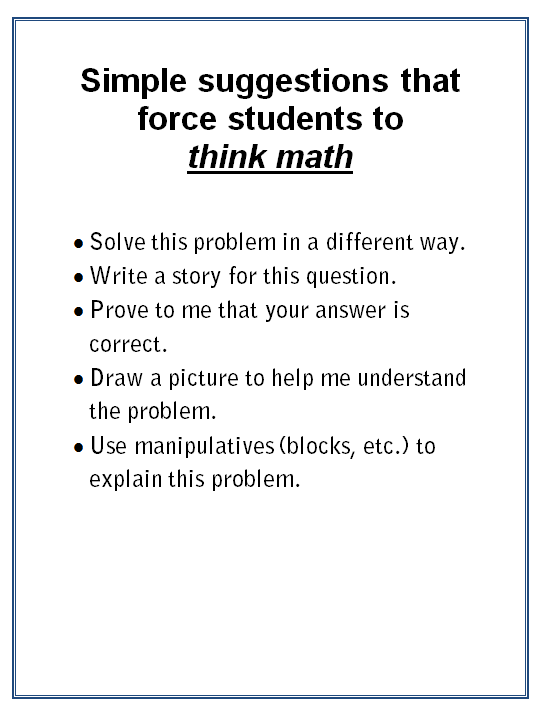 But, introducing this concept at a younger age will help students begin to think and answer the question, "Is this right?" for themselves, building confidence in themselves. Being able to prove shows a higher level understanding of concepts and will be a valuable skill in life as well as school. Draw a picture to help me understand the problem. Drawing a picture or a graph, showing numbers in a different way is so powerful for kids of all ages. Being able to convert numbers into pictures connects mathematics for students. Leaving this open-ended just increases the power of the statement. Use manipulatives (blocks, etc.) to explain the problem. Giving abstract concepts concrete examples is powerful at every level. This one will take the most time but will give you great rewards in understanding and retention. There are virtual algebra blocks online and many other manipulatives as well. 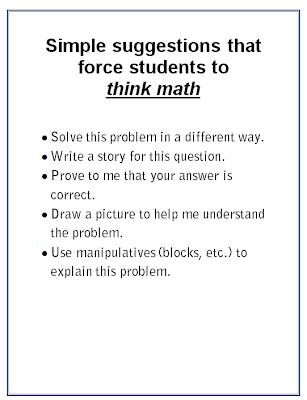 I find that in my classroom I have so many students that are so insecure in their mathematics, in many cases these suggestions build confidence in their ability to solve problems on their own.